Saturday was a bit of a dreary day, perfect for cooking and cleaning. Today started out a bit chilly, but the sky was blue, the sun was shining, windspeeds were forecast to be well below ludicrous (for a change - last couple of weekends the winds were up at speeds technically known as "honkin'") and temperatures were supposed to be up in the 40's. I was rude and antisocial and didn't invite anybody else to come - actually I just didn't want to commit myself to anything because I felt a terrible attack of the lazies lurking about after all the housework on Saturday, but in the end they didn't strike too hard and I was able to fight them off when I remembered that friends at the club had mentioned seeing a lot of ospreys recently and decided that today was a nice day for an osprey hunt! All shooting to be done with a camera, of course - pictures from the day down at the bottom of the post. My plan was just to paddle out to the osprey platforms I know about and see if there were birds there yet. I ended up doing about 12 miles, I think; I started with the Canarsie Pol platform, the closest to the club (heigh, ho, nobody home), then headed on out to the one at the Jamaica Bay Wildlife Refuge, with visits to a couple in the marshes out by Broad Channel on the way out and back. One osprey was home - didn't get close enough to get a very good picture 'cause I didn't want to scare him or her, but it was nice just seeing this bird, which is a way better harbinger of spring than the robin around here (here's a robin in the snow in Central Park on President's Day weekend, just by way of example, and I've seen them in Prospect Park in January). Also spotted on today's paddle - lots of oystercatchers (another bird who truly does leave the area in the wintertime - I think I heard some down in the Caribbean, and I was absolutely delighted when I was looking through photos posted by a friend who visited the Galapago Islands in the wintertime a couple of years ago and found, there among the iguanas and exotics, a beautiful shot of one of these birds whose calls are so typical of summer on Jamaica Bay). Still lots of buffleheads and brants around but when the ospreys and oystercatchers are back, warmer weather can't be far behind! Also spotted - smoke from a fire I can't find any information about (there was a lot of smoke but it went away pretty fast, and I'm hoping the lack of news means it wasn't a bad one), and an aid to navigation which isn't quite living up to its name right now (Coast Guard, if you're looking for Jamaica Bay green can #1, it's beached on the west side of Ruffle Bar). Nice day out there. I'm definitely still feeling the effects of my very inactive February, I was running out of steam when I was still a couple miles out. I skipped one last easy possible nest site - ospreys have tried the Carnarsie Pol day mark, although I don't think they've ever actually stayed there for a full season. I paddled by it and there was a bird that may have been an osprey there, but it may also have been a cormorant and I just didn't feel like making a side trip to see! I made it home fine in the end; I expect to be sore tomorrow, but pleasantly so. Oystercatchers - wheet, wheet, wheetwheetwheetwheetwheet! Hard to see but that IS an osprey! Platform at Jamaica Bay Wildlife Refuge - didn't see anybody but there's a big solid nest there at least. Ospreys will build on their old nest if it doesn't blow away through the winter (as happened to the Carnarsie Pol platform - not a twig left). I got a little closer to this one, a motorboat had just pulled up very close to look and nobody flew up, so I figured the occupants were away. Lovely clear day, nice to get the platform with the city skyline. Empire State Building just to the right of the platform. Jamaica Bay Green Can #1 is not currently aiding any navigation! West end of Ruffle Bar. Note on 3/30 - So if you ever run across anything like this, here's how you tell the Coast Guard. They probably already knew but I figured it couldn't hurt to check their website, and their "contact us" link does a really nice job of walking you right to the proper form. Justine Curgenven - did I mention she's in Brooklyn tonight? OOH OOH OOH! JUSTINE C! Here in Brooklyn! 7:30 PM, doors open at 6:30! Tonight (Thursday March 26th)! Ryan Visitor at Floyd Bennett Field, with special guest Sarah Outen, talking about their adventures and showing film clips of their paddle through the Aleutian Islands. SHE'S SO EXCITED! So is Sebago! Please RSVP at either the Facebook event page (click here for that) or to contact"at"sebagocanoeclub"dot"org so the club knows how much cheese to bring. Note - Do NOT use the map on the facebook event page, it shows Riis Park, and that's just not where we'll be. Use Google maps to look it up instead (look for Floyd Bennett Field, Brooklyn - the center is just off of Flatbush Avenue, if you want to see exactly where, click on the map link at the NPS J-bay accessibility site) , or follow the link over on the Sebago website, www.sebagocanoeclub.org. UPDATE! FABULOUS NEWS! The boat was mysteriously returned to Cat's garden last week! Cat had a ton of friends helping to spread the news, and she thinks that maybe the thieves got wind of the fact that people were going to be looking for this unique boat and decided it was too hot to handle. It's amazing that they actually brought it back instead of just ditching it somewhere, but however it happened, Cat's ecstatic! 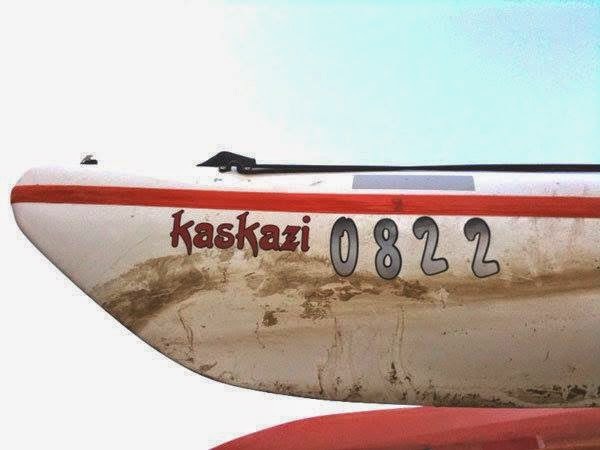 STOLEN, PLEASE SHARE: KASKAZI DORADO II. With great sorrow I report the theft of my Dorado from my garden in Pembrokeshire, Wales. I just checked under the blue tarp I keep her under and she was gone. 15.5 feet long, orange and white gelcoat, back crate is missing from well (I have it in my house). I have fond memories of this boat, and it completed the MR340 one year in Missouri as well as many fishing tournaments on the East coast. Message me (her - here's the original Facebook post) if you have seen it or heard it might be for sale. If by some wonderful chance you have spotted this boat, either in person or on Craigslist or something, and you don't have Facebook, you can email the info to me at bonnie13 "at" earthlink.net - please use "Stolen boat" as the subject, if I haven't got your email in my address book, it will get screened, but I'll be watching the screening folder for that subject. Thanks! So there was that silly silly snow on the first day of Spring, but the weekend actually warmed up some -- not quite balmy, but nicer than Friday -- and had lovely sunshine and blue skies and since I'm getting into one of those times of the year when I spend way too many hours at my desk, I wanted to get outside for a while. Saturday we went up to CT to say hi to TQ's folks, so Sunday was the day for some activity. Earlier in the week I'd been hoping for a paddle, but it was again a bit windy, so I decided to stick with a good walk. TQ works for the Parks Department and gets as much fresh air as a body could want, so he doesn't get quite as antsy about getting out on weekends as me (especially when it's budget season at my office); he actually decided that what he wanted to do was get a batch of beer started (YAY - he makes very good beer and it's been a while since the last batch). He did an inventory of his brewing supplies on Saturday night, after we got back from CT, and discovered that a trip to a homebrew store was in order. He checked online and found that Brooklyn Homebrew carried everything he needed, and then I looked at where they were and discovered that they were a little less than two miles from the new Bush Terminal Park in the Sunset Park area of Brooklyn. That struck me as a good distance to an interesting destination; it just opened last October, I seemed to recall a couple of friends who'd been there being quite favorably impressed, and it's someplace different -- I have a certain set of places I tend to ALWAYS go when I feel like going for a long walk (Red Hook, Brooklyn Bridge Park, Sheepshead Bay, etc.) and I like them all but every now, but it's a big borough and I enjoy seeing parts of it I haven't seen before! I told TQ I would ride over with him and then if he wanted to go find the park with me, he could, or if he wanted to he could head on home and get going with his brewing and I would get myself back in time for dinner. I'd never walked in the area I was going but I knew I could get to the F train from there, if I didn't find something better first (I don't happen to own a phone that tells me how to get places but in this case I wasn't too far afield). Brooklyn Homebrew was very nice. We'd been somewhere else in Brooklyn in the past to get supplies, but this place was much bigger, with a better selection. TQ got the yeast that he needed, a few other odds and ends, and some barleywine pointers (not a type he's tried before but he found he had kit for that when he reviewed what he had, so that's what he was going to make) from the guy at the shop. I got a cheese kit. This'll be fun! We'd gotten a bit of a late start and weren't done at the store until 3, so TQ decided to run along home and start brewing, while I set out for Bush Terminal Park. Started out walking along 3rd avenue for a while -- impressive mural here -- then went down to 2nd avenue. This was getting into a pretty industrial area, lots of warehouses, and I wasn't sure that I would be able to get through if I went closer to the water, so I stayed on 2nd. See the Statue of Liberty here? No, really, she's out there! Interesting, seeing all the train tracks running around the area - this one had run from the docks into a loading dock in one of the warehouses, but at some point the warehouse stopped sending and receiving goods that way and the sidewalk was laid right over top of them. These were all over the place, it must have been something to see when they were all in use. Here's one of the older-looking buildings I passed. Turned out to be a Superfund site - this was Empire Electric and I don't know what they were using here but it must have been bad (PCB's like General Electric, perhaps?). Interesting old building though. I walked and I walked and I walked and I walked and I walked and at a certain point I started to suspect that I'd missed the park. I'd been walking along 2nd avenue expecting that I would be able to see it from there; I guess I was assuming that the construction of this park would've followed the Hudson River Park pattern, where most of the old waterfront structures got torn down and the area just overlaid with shiny new stuff that looks distinctly parkish from a ways inland. Thinking that, I hadn't really noted what street I would need to turn down to get to the park, but by the time I got to 60th street I was thinking "I should've been there by now" and when I got to the Belt Parkway, I knew I'd missed it. I walked under the parkway to Owls Head Park - thought about walking around in there for a bit but decided to just head back, going down to the ferry dock at the Brooklyn Army Terminal to at least get a couple of waterfront pictures. I was glad I'd come this far, though, because I think the facility shown below (tucked in just north of the Belt Parkway) is the Brooklyn end of the last marine railway in New York Harbor. Click here for an interesting WSJ article with video about this system, which used to be the standard way of transporting goods between New Jersey and NYC. Railroad cars would be driven onto barges with tracks and then taken across the harbor by tug; there's one business still doing this and I think this has got to be where they land. I of course learned about this means of freight transportation back when I kept my kayaks on a barge at Pier 63 - that barge was one of these rail cars. She'd been retired and repurposed, with a bar and grill, a performance space, and of course boat storage (back in those days) - you'll actually see a glimpse of the place if you watch the video, watch for the red caboose (a nod to the barge's working past) at 1:25. I didn't know that this was still going on for a long time; I've still never seen the cars on the car float (I'm probably always at work when that's going on) but I enjoyed seeing the facility where they come in. Heading back, I walked up to where the ferry to the Brooklyn Army Terminal docks, just to get a look at the harbor. Lots of whitecaps, definitely a good urban-hiking day (rather than kayaking). This must be a sanitation department facility - hope they're putting those plow blades away for the last time in the first half of the year! And hey - I bet that's the park I was looking for! Turned out that they hadn't done the clearing of the entire waterfront thing like they did in Manhattan - this park was tucked in behind a working facility. I couldn't really see a way to get there from here, though, figured I'd come back on another day to figure that out, just took my picture and kept walking. But just beyond the facility where I'd spotted the park across the way, I saw a parks sign by what I would've otherwise taken to be the gate to another commercial facility (never would've guessed it from 2nd Avenue). And yes, this is it! At this point, my planned four-mile hike was running a good bit longer (ended up being closer to 6, which was fine), I was still a couple of miles from the F train if I didn't find something closer (I did, but I wasn't counting on that until I found it), and I didn't want to spend too long here - but I had to at least go in and get a better look at the park that's tucked away around the corner here. And oh what a VIEW!!! Click for a better view of this view. Seriously. Gotta run now, but I'll be back! 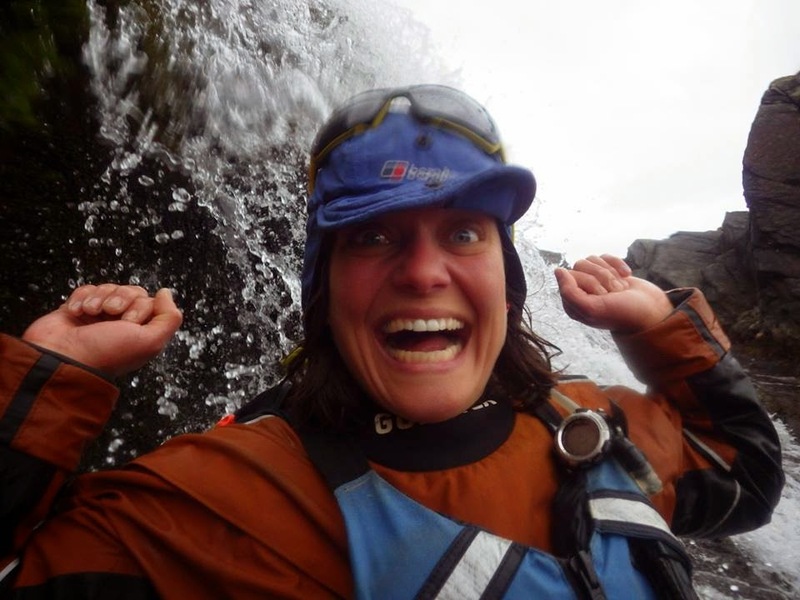 OOOH - week-of update - Justine's Aleutian Islands expedition partner Sarah Outen will be joining us at the Brooklyn event, too! Better and better. Don't forget, the Sebago Canoe Club is proud to present the one and only Justine Curgenven, next week Thursday (3/26/2015) at the Ryan Visitor Center at Floyd Bennett Field on March 26th! OK, it's only near you if you live hereabouts, but if you do, well, come on out, it's gonna be great! Please RSVP so we know how much cheese and stuff to bring. RSVP details at end of post, thanks! Kayaking 2,500km along the Aleutian islands Come and hear award winning filmmaker and expedition sea kayaker Justine Curgenven talk about the highlights and challenges of her world first kayaking journey along the Aleutian islands and Alaskan peninsula, described as "the greatest technical sea kayak expedition in the world". 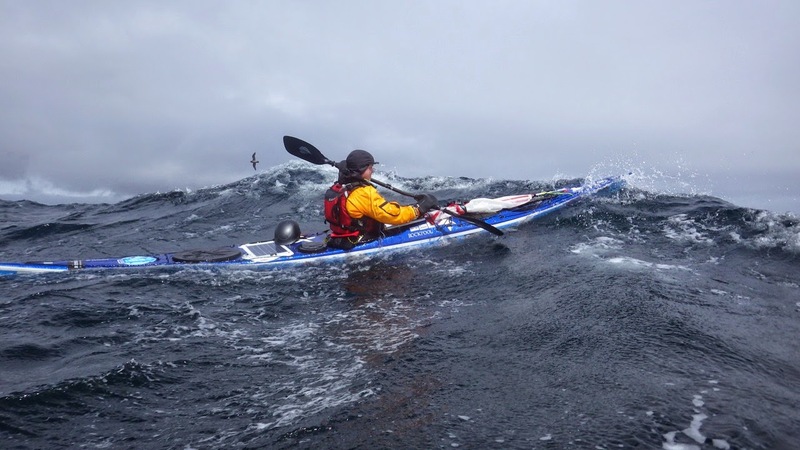 With round-the-world adventurer Sarah Outen, she set out to paddle 2,500km along the archipelago to the nearest road confronting more than 20 long crossings which separate the tiny unpopulated islands. Alone for 101 days in one of the windiest, roughest places on earth, these two women are swept away from land by unknown currents, pounded by rough seas and approached by bears. Experiencing an edge-of-your-seat journey, they gain a rare insight into themselves, the rich wildlife and the lives of the few people who live in this harsh yet beautiful landscape. Justine will show video clips from the highly-anticipated film and tell behind the scenes stories. Donations are requested to help defray Justine's travel expenses. Refreshments will be served. If you'd like to attend, please RSVP either to the general Sebago Canoe Club email address, contact"at"sebagocanoeclub"dot"org, or on the Facebook event page. For instructions to Floyd Bennett Field, use Google maps (the map on the Facebook event page is completely wrong for some reason). Hope to see you there! The oystercatchers are back, hooray! Nice little postscript to our paddle - as one of my friends was loading his boat onto his car after we got back, a couple of gentleman from the bay patrol, who were there in a car when we got back and may have watched us launch, too, drove up to him and asked - very nicely, he said - if we were all off the water now. Matt said yes and thanked them for keeping an eye out for us. They really would have been within their rights to quiz us before we launched - they had a boat there at the marina and they would've doubtless been the ones who would've had to come out to save our sorry behinds if anything had gone wrong. I like that they chose to trust us to make our own call, but were still clearly watching out for us. Thank you, Point Lookout Bay Patrol. And I'll also take this opportunity to get in my first Spring safety plug. We're coming up on the first day of Spring here, the forecast does show a chance of more snow on Friday (noooo!) but we've had a heck of a nice little warm spell here and it's not going to be long before that first weekend when the sky is blue and the air is warm and the boaters who don't go out in the winter start itching to pull the kayak or the canoe out of the garage, sweep off the dust, and get out there. Please be careful if you do, this is actually a terrible time of year for boating accidents, the water here in the Northeast will stay treacherously cold for a couple more months - if a person goes out in jeans and a t-shirt on a nice warm day and doesn't fall in, which would be the more usual case, they'll never know they dodged a bullet, but on the off chance that they do, it can turn tragic far too easily. Here in New York State, the winter lifejacket rule is still in effect - anyone going out in a recreational vessel of 20' or less must be wearing one, no exceptions - and beyond that, proper immersion gear will buy you a lot of time in the event that something goes wrong. For more information, follow any of the links in my Cold Water/Off-Season Boating Safety Sites list, over to the right. This is a lovely time of year to be on the water, the birds are starting to migrate through or return (I saw and heard my first oystercatchers of the season on Sunday, wheeet wheeet wheeetweetweetweetweetweetweet!) and the recreational traffic isn't up to full summer swing - let's just be safe out there, though, ok? First Paddle since the Bioluminescent Bay! I'm thrilled to announce that today I went paddling! It's been WAY too long. This was my first paddle since January 22nd, the night the Kinja gang had such a spectacular night on that wonderful bioluminescent bay in Vieques. Earlier today I was actually thinking that my last paddle had been the Frostbite Regatta at the club on New Year's Day: I guess I didn't think of Vieques because it was such an utterly unusual paddle, but yes, it should count! 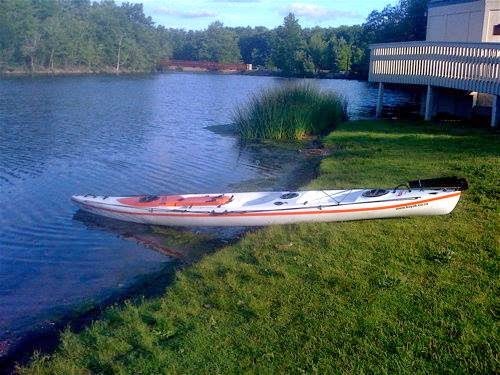 However, that still makes it awfully close to two months since I've paddled, and I can't remember the last time I went that long without paddling; it may have been when they closed NY Harbor to recreational boaters for some time after September 11th, 2001. This winter I ended up being kept off the water by a nasty double-whammy -- there was a cold, one that I came down with a week after returning from the Caribbean that just stayed and stayed and stayed, going through various stages (eventually when it went into a sinus infection stage I went to the company health center, and the physician's assistant who saw me there said I had the most popular bug of the season - everybody had it and nobody could get rid of it in anything like a reasonable amount of time, so at least I had company), and then there was THE COLD - our very long and nasty cold snap that froze the entire Hudson and a lot of the waterways around NYC. It was weirdly convenient to have them going on at the same time -- the Paerdegat ended up being frozen solid (click here if you missed my frozen basin pix), so if I hadn't been sick there would've been some major paddle jonesing going on, and the basin being frozen while I was sick kept me from being too bummed about being sick ("oh well, at least I'm not missing any paddling") -- but enough is enough, I'm finally feeling better, it's warming up, and I'm SO ready to start getting back out there again. Last week's gentle urban hike was a perfect way to get moving again, I was a bit shocked to find I was sore the next day when ordinarily a four-mile walk wouldn't phase me but at the same time that just means I need to do more. Today's paddle was supposed to be the club's annual Jones Beach sealwatching trip. That usually happens earlier in the year, January or February, but the bad weather had delayed it. However, there were reports of lots of seals still being around, and early in the week, with the forecast showing weekend temperatures in the 40's, Steve H. (the Paddling Chef) decided it was time. I was thrilled to see that; usually the seal paddle is five or six miles, with lots of pauses when we find the seals (or they find us, they're very curious animals and it's never entirely clear who's watching who). As long as they have the proper gear (drysuits and hoods this time of year), paddlers don't have to be that experienced to paddle the sheltered marshes where the seals like to haul out and bask, so we don't even tend to be moving that fast. Perfect level for someone who spent so much of February holed up with an economy-sized bottle of Nyquil and a humidifier! And then after the paddle, of course, there's the traditional stop at Bigelow's, a fantastic fried-seafood place in Rockville Center. This is always one of my favorite winter paddles, and I was so excited about it! It was a very long week at work but every now and then I would think "yeah, but I'm going paddling on Sunday" and that kept me going. I guess I hadn't been watching the forecast though. Or maybe it just deteriorated very abruptly. Whichever it was, last night TQ and I checked the forecast and...oof. Sunday's weather was looking very EMPHATIC. Still pleasant temperature-wise (amazing how good low 40's feels after a streak in the 20's and worse), still chance of showers (that's OK, this time of year we're wearing waterproof onesies anyways), but the wind? Gadzooks. Something like 18 to 24, gusting to 38. We checked email to see if the paddle had been cancelled. Nope, some discussion, but Steve said we'd just paddle straight into the wind going out to make it easy coming back. We checked again this morning. Same forecast mostly, down by a little bit, but still up there in the "Is this really a good idea?" category. Under normal circumstances, I might have entertained serious thoughts of bailing. But I'd been looking forward to it all week, I'd packed up all of my winter gear and schlepped it over to TQ's the night before (he'd made oxtail for dinner, delicious! 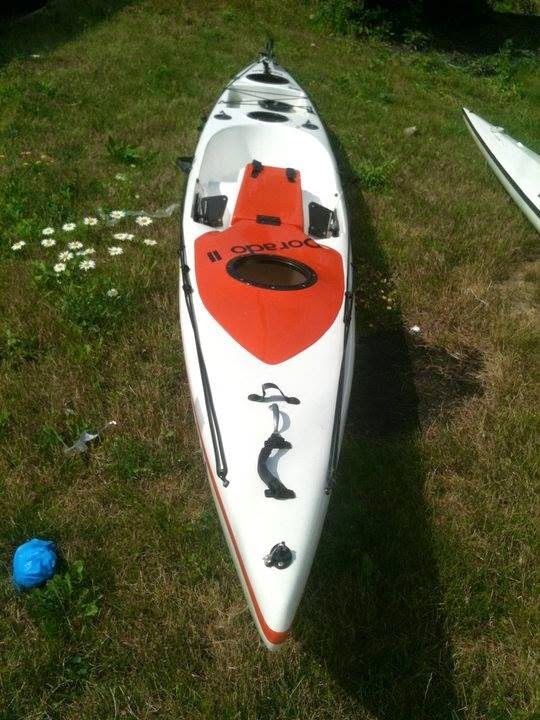 ), and dagnabbit, if Steve H. was crazy enough to not call of the paddle entirely, I was crazy enough to try joining him. Ended up being a fine day. The folks that showed up were just the sort of people you would want to go paddling with when there's a small craft advisory on for your first paddle after a miserably inactive month (solid, level-headed, good-natured and with strong skills). The wind was definitely intimidating; it was actually flipping TQ's boat over (his is very light, but still!) when we'd first put our boats down on the grass at the Marina West Town Boat Launch at Point Lookout, where we launched, and the water outside of the marina was filled with whitecaps. We were all game, though, so we set out. We did exactly as Steve H. had suggested, setting out into the wind so that getting back would be easy. Two of the group dropped out almost immediately. The rest of us decided we were comfortable enough to keep going, but we did it in chunks - first, "Let's just get to that island" (Middle Island). Then, "Let's just paddle along the island" (it was just high enough that it offered a little shelter). The sun came out and shone very beautifully at one moment, and although I'd said that I didn't think I would take any pictures once we'd left the marina, I gave it a try - got in trouble doing that though because I got turned sideways to the wind and then was having a terrible time turning back into it; eventually I just paddled over to the island, which has little tussocks around it, stuck my bow against a tussock, let the wind turn me back in the right direction and then was a lot more careful about watching my angle to the wind while taking pictures. Steve H. decided to go back partway down Middle Island, as he realized that one of the folks who'd gone back early had stuff in his car; he told the rest of us we could go on. I suggested the little red house that was a little farther west on the same island as the next destination. We got there fine, I was still feeling good, at some point we'd figured out that the water was two feet deep, which made the situation feel much less fraught (if worse comes to worse, just stand up and wade, right?) and we decided that the next destination was the next island to the west (Cinder Island). That took us out of the shelter of Middle Island and boy, there were a few moments as I was clawing my way into the wind that I wasn't sure I was going to make it there - I was barely making headway, I thought about picking up my cadence but couldn't seem to muster the energy to do that (plus the wind was really grabbing at my paddle). I gritted my teeth and kept slogging and eventually I got to the little cut in the island that the rest of the gang had gotten to and admitted I'd had enough - going home was going to be a lot faster, but downwind paddling does require energy too, so I wanted to head back before I was completely wiped out. I especially knew I was worn out when I saw a handsome pair of ducks very close by on shore, and puzzled and puzzled and puzzled over why they weren't flying away, and only realized that they were decoys after I saw the third decoy that TQ and Mark were playing with. Tired! Trip back was swift but I was glad I'd called for the turnaround when I did - there were some lovely little waves heading our way now and it felt so so so good when I caught a nice ride on one of those and could just stop paddling for a few seconds - but of course you have to work to catch those guys. I had enough gas to get back to the marina without any trouble, but I'm not sure how much I had left when we got there. Oh. Seals? Countless. As in, we saw nothing to count, so we were countless. There may have been seals around, laughing at us, even, but it just wasn't a good day to look for them - stop concentrating on your boat, your paddle, and where you're trying to go, and you'd probably find yourself swimming (or wading, as the case probably would have been). Measuring out the trip tonight, I think we did a little under two and a half miles - but somehow this time it felt like we earned our Bigelow's! Photos from the day - click the first one for a slideshow view. USVI Day 10 - Back to St. John.